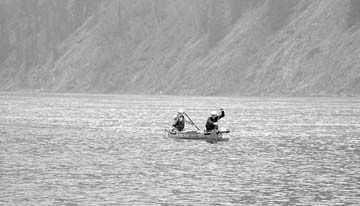 First place was already locked up, but it was a sprint to the finish for second place in the 2004 Yukon River Quest. Whitehorse’s Stephen Mooney, traveling in a solo kayak under team name Promithian, faced off against team Gerwing/Hodgson, which was made up up Whitehorse’s Tim Hodgson and Chris Gerwing from Winnipeg. The three men had been travelling down the Yukon River together since about 12 hours into the race and none of them was about to give up any ground. When the sprint was over, Gerwing and Hodgson claimed second position by just five seconds and Mooney had to settle for third, although he insisted there wasn’t much disappointment. The previous record in the men’s solo kayak was 48 hours, 54 minutes. Mooney called this year’s River Quest a “tough race” for him, with small hallucinations from being sleep-deprived. He said traveling with Gerwing and Hodgson, as well as fourth-place finisher All North/Waterstone Frontec – a tandem canoe team comprised of Whitehorse residents Francis Roy and Jean-Francois Latour – helped everyone push each other and reduced all of their times. In fact, there were five new time records set in this year’s River Quest. Ingrid Wilcox of Whitehorse broke her own previous record for the women’s solo kayak by more than seven hours, with a time of 55 hours and 56 minutes. Yvonne Harris and Pat McKenna of Whitehorse broke their previous record for women’s tandem canoe by about two hours, with a time of 57 hours and 22 minutes. (British Broadcasting Corporation) Challenge team set a record of 51 hours and 13 minutes. The winning team of Michigan’s Steve Landick and Bruce Barton did not set a new course record (they were off by 18 minutes) but beat the stock tandem canoe record by 43 minutes. While Mooney acknowledged the river speed was faster this year than last, he’s not sure it was the fastest speed in the event’s history. “I think it was the temperature,” he stated. “The temperature really played to my advantage because I didn’t have to change clothes. I didn’t put a piece of clothing on all race. The Whitehorse resident did, however, suffer a couple of mishaps during the race, starting about two hours into it when his seat broke. He had to fix it as best he could until he made it into Carmacks. “In Kirkman Creek, my food got eaten by a dog when I was sleeping,” he added. Luckily for Mooney, there was some extra food stored in a front compartment that the dog didn’t get at. As for the water, he drank from the Yukon River the whole way – untreated. Mooney said through most of the race, it was just friendly competition between the two teams. But towards the end, he said, they started to get a bit more serious. Both teams had to paddle through a lot of smoke due to fires on the way to Dawson, especially near Kirkman Creek. Although it affected his mind and sight somewhat, Mooney doesn’t believe the smoke really slowed him down, although he has some ideas on what did. “In hindsight, I know where I could have shaved some time,” he said. For a few of the teams, time was lost due to a dump. Whitehorse’s Linda Bourassa (Grandma Bun Bun) was traveling with Jim Jager and Edward Jager (Sanguine) of Anchorage, Alaska, and Utah respectively, about 30 miles away from Carmacks. The two men had just finished taping up Bourassa’s back, which was hurting from a rash, after the original moleskin had come off due to the water. They started paddling down the river side by side when they hit some white water. Bourassa saw a huge boil in the river – which she described as the biggest boil she had ever seen – and then another one started under her and joined the boil she had been looking at, which created a whirlpool. She didn’t have time to brace herself before her kayak flipped. The Whitehorse resident managed to get out of her kayak but remained attached to it because her water tube was connected to her spray skirt and she couldn’t break free from it. Her head was just barely above the water. “I was trying to hang onto my kayak,” she said later in an interview. her hold on the kayak. “With their help, I got back in, got turned around again and started down the river,” she said. The two men found her sponge and map later down the river, so the only thing she ended up losing was her hat. Bourassa also said the scary event cooled her off because it was so hot, and energized her. 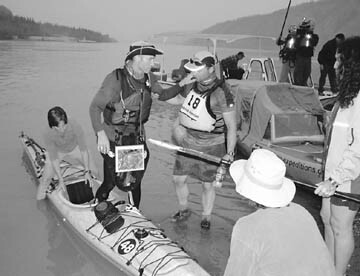 While Bourassa kept paddling after Carmacks and finished the race, 15 teams would scratch at the first checkpoint, and another team scratched soon after. A record 51 teams started the race June 23, and 35 finished the event by 6 a.m. on Sunday.